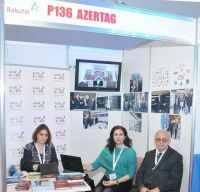 Azerbaijan State News Agency (AZERTAC) has demonstrated its stand at the “BakuTel-2015” the 21st Azerbaijan International Exhibition on Telecommunications and Information Technologies, at Baku Expo Center. The stand features the agency`s printed and multimedia products, including "Travelling across Azerbaijan" project, which highlights the country`s historical and must-see places. Visitors to AZERTAC`s stand were informed on the agency`s applying advanced technologies in news production. Apart from local companies, this year`s exhibition brings together 200 companies from 21 countries. They include leading information and communication technologies companies, Azerbaijani mobile operators, internet providers, system integrators and famous brand distributors.